The furniture carpet beetle, Anthrenus flavipes (LeConte), is a common pest of upholstered furniture. Like other species of carpet beetles, it is able to digest keratin, the principal protein found in animal hair and feathers. Figure 1. Larvae (lower left) and adult of the furniture carpet beetle, Anthrenus flavipes (LeConte). Photograph by Clemson University; www.insectimages.org. The furniture carpet beetle is a cosmopolitan pest and is most destructive in warmer parts of the world. In the United States, the furniture carpet beetle is primarily a pest of the southern states but may also be associated with heated buildings in northern states. The furniture carpet beetle undergoes complete metamorphosis, passing through the egg, larva, pupa, and adult stages. The complete life cycle requires four to 12 months depending upon the temperature. Adults: Adults of the furniture carpet beetle are round, 2 to 3.5 mm long, and black with a yellow and white mottling of scales on the back, and thick yellow scales on the legs. Color patterns vary but the adults can be distinguished from other species of carpet beetles by examining the body scales with a hand lens. The furniture carpet beetle has round or oval scales while other carpet beetle scales are long and narrow. Adults may be found feeding on the pollen of flowers, but do not cause damage to the flower. The adult furniture carpet beetle has a life span of 30 to 60 days. Eggs: Females lay 35 to 100 white, oval eggs that are visible upon inspection. The eggs are 0.35 mm wide and 0.75 mm long and are deposited in cracks and crevices near the larval food source. Eggs hatch in one to three weeks. Larvae: The larval stage of the furniture carpet beetle is responsible for causing damage. The larva is 5 mm long, oval, and covered with brown hair. The larva of the common carpet beetle, Anthrenus scrophulariae, is difficult to distinguish from that of the furniture carpet beetle. One way to distinguish the furniture carpet beetle from the common carpet beetle is to look for the presence of a long pencil of hairs at the end of the body that continually vibrates, which is indicative of the furniture carpet beetle. Larval color is dependent on the color of the food substrate. The number of larval instars may vary from six to 12 and requires two to three months before pupation occurs. 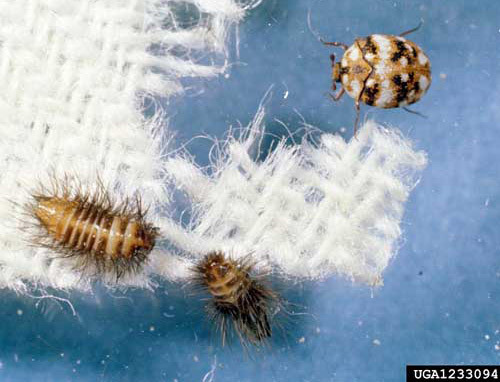 Pupae: The larvae of the furniture carpet beetle pupate in their last larval skin and are white in color. Pupation occurs on or near the larval food source. The pupal stage lasts an average of two to three weeks depending on temperature. The furniture carpet beetle is capable of significant damage if infestations are undetected. It can destroy upholstered furniture by devouring both the padding and the covering. The furniture carpet beetle consumes any suitable food source rendering products unusable or aesthetically unappealing. Furniture carpet beetles are found on furniture where they feed on hair, padding, and upholstery. Other food sources include carpet, fur, horns, and silk. Cotton, linen, rayon, and jute may be attacked when stained with animal body oils or excreta. The current practice of encasing furniture horsehair in a green rubber coating does not protect horsehair from infestation. Dried insect specimens such as those found in insect collections are also devoured. Additionally, individuals in close association with infested items may suffer allergic reactions as a result of exposure to beetle fragments, cast skins, or dusts. Furniture carpet beetles can be detected by a close and thorough inspection of susceptible household goods. The presence of any furniture carpet beetles could warrant corrective actions. Depending upon the value of the infested items, some may choose to discard the items while others may choose control options in an effort to salvage the goods. Careful inspection is the first step in controlling furniture carpet beetle infestations. All susceptible materials must be inspected for the presence of larvae, their cast skins, and damage. The adults may also be observed emerging during the warm summer months. Proper sanitation cannot be overemphasized for controlling the furniture carpet beetle. An important tool that is used in sanitation is the vacuum cleaner. A vacuum can be used to remove pet hair, human hair, and loose fibers from furnishings, carpets, and clothes. Steam cleaners are more effective when cleaning infested items since hot soapy water kills all stages of the furniture carpet beetle. Infested clothes and furs should be professionally dry-cleaned. Cold storage treatments may also be effective for infested items such as furs. In the case of heavy infestations, insecticide treatment may be necessary. Before making insecticide treatments for carpet beetles, the premises should be thoroughly vacuumed. Furniture should also be thoroughly cleaned before treatment to avoid staining the upholstery. Cracks and crevices can be treated with an insecticidal dust such as diatomaceous earth or silica aerogel. These dusts may also be applied at the edge of carpeting near the baseboards in infested rooms. Spot treatment of rugs may be made with residual sprays. Emulsifiable concentrates are the best formulations for treatment of carpets and rugs. Paradichlorobenzene and napthalene (moth balls) offer little protection against furniture carpet beetles. Paradichlorobenzene has been shown to slightly inhibit feeding but is not an effective repellent. Black J. 2004. Fabric and museum pests. pp. 581-633. In Morland D (ed. ), Handbook of Pest Control (Mallis A), Ninth Edition. GIE Media, Inc.
Bry RE, Lang JH, Boatright RE. 1982. Feeding by larvae of three species of fabric insects on wool/synthetic blend fabrics: Attagenus megatoma, Anthrenus flavipes, Tineola bisselliella. Journal of the Georgia Entomological Society 17: 280-282. Robinson WH. 1996. Urban Entomology: Insect and Mite Pests in the Human Environment. Chapman & Hall, New York. Bennet GW, Owens JM, Corrigan RM. 1997. Truman's Scientific Guide to Pest Control Operations, 5th Ed. Advanstar Communications, Cleveland. Su NY, Scheffrahn RH. 1990. Efficacy of sulfuryl fluoride against four beetle pests of museums (Coleoptera: Dermestidae, Anobiidae). Journal of Economic Entomology 83: 879-882. Traynier RM, Schumacher RK, Lau DM. 1994. Oviposition site selection by Tineola bisselliella, Tinea spp. (Lepidoptera: Tineidae) and Anthrenus flavipes (Coleoptera: Dermestidae). Journal of Stored Product Research 30: 321-329.